Hirlekar Precision is one of the largest differential pressure gauge manufacturers in the world. Our gauges, which are based on magnetic coupling principle, are used in filtration and cryogenics industry. Quality assurance and reliability is maintained through a set of fixed protocols. More than 80% of production is exported to 50+ countries around the globe. We can communicate efficiently in English, Deutsch, Hindi, Marathi and Gujarati. High and Low pressures are separated by a sensor assembly consisting of a magnet, diaphragm and a range spring. The difference in pressure causes the assembly to move in proportion to the change against the range spring. A rotary magnet, located in a separate body compartment and isolated from the acting pressures, is rotated by magnetic coupling as per the linear movement of the sensor assembly. A pointer attached to the rotary magnet indicates differential pressure on the dial. 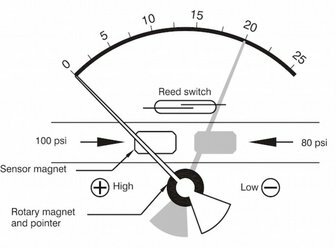 Reed switches are located adjacent to the pressure chamber and are activated by the magnetic field. Mount the instrument at least 50 mm away from ferro magnetic surfaces, else calibration may be shifted. Global standards in manufacturing and documentation are maintained through compliance and strict adherence to ISO standards. Hirlekar Precision DP gauges can be found in North America, South America, Africa, Middle East, Europe, Asia and Australia. We have distributors, partners and customers in more than 50 countries. "More than 80% production exported to 50+ countries"